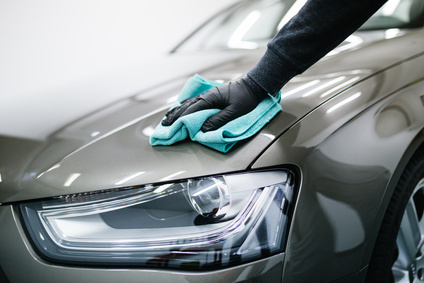 Whether you buy a new vehicle or get one from an online auto auction, regular maintenance – be it cleaning the exteriors and interiors or addressing the issues under the hood – is essential to get the most out of your investment. To keep your vehicle looking as good as new, you can use a number of easily available substances. If you are looking for unique and easy ways to keep your vehicle sparkling clean, you have come to the right place. Go through this blog to discover three simple hacks to keep your vehicle as good as new. No matter how careful you are, someone or other is bound to spill something on your cars carpets, which can easily stain or even damage them. Spills such as milk and juice, can be a cause of worry, as they produce a foul smell after a while. Baking soda offers an easy way to deal with the problem. All you need to do is sprinkle baking soda over the stain, scrub it lightly, let it sit overnight, and vacuum the carpet the next day. If there is still any smell or stain, you can repeat the procedure. To get rid of stubborn stains from your car’s windshield, you can simply use club soda. There are two ways in which you can use club soda to clean the windshield of your vehicle; you can either pour it or spray it using a spray bottle. Wait for at least 20 to thirty minutes for the club soda to do its work. Use a paper towel or microfiber cloth to wipe it off and see the residues vanish instantly. If there are any marks that are stuck on your vehicle’s windshield, you can scrub it off with a paper towel soaked in club soda. It is known that soft drinks, especially cola, have a strong, acidic drink that can be used to clean severely dirty surfaces. What you might be surprised to know is that it is also an excellent cleaning agent for your car’s chrome parts. Take a clean cloth, pour cola on it, and use it to clean your car’s chrome parts, such as emblems, running boards and grille. Using cola to clean these parts removes discoloration and corrosion, giving a brilliant shine to the chrome parts of your car. It is, however, important to wash all the pieces with water after cleaning. The tips we have shared will certainly help you keep your car in top shape. If, however, you are still waiting to get your hands on your dream ride, AutoBidMaster.com can help make it happen. We have an extensive collection of used and salvage vehicle from all leading national and international brands. Check our inventory and register to start bidding on your dream machine. If you have any questions about our bidding process or the vehicles listed with us, simply call +1 503 298 4300 or fill out our contact form.